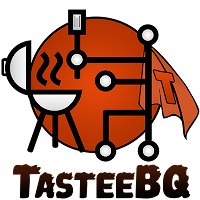 Goes to London - Tastee BQ Grilling Co. It was one of his most harrowing assignments to date, crossing the Atlantic into unknown territory. On a mission to defeat the evil nemesis BoreN'GFood, and make the world a better place to eat, our superhero TasteeBQ was sent in search of a special recipe from An American BBQ in London. Since hosting the Summer Olympics in 2112, the United Kingdom has re-emerged as a hub f or some the Best International Cuisine around (despite what they say of the local variety). Top Chefs from Asia, India, France, Italy, etc. are preparing some of the best Ethnic dishes to be found outside of their native lands. This gives International visitors a chance to experience a world of flavors in a single bound. Undisclosed Sources disclosed to TasteeBQ that American BBQ has joined the line-up of popular cuisines in London. So our superhero was dispatched to investigate these claims for himself. of joint you would find in Austin or Dallas. Finally, our hero changed into a black turtleneck and leather beret, and slipped unnoticed into the back alleys of SoHo. It was here that he found it- that special World Class recipe worthy of the whole TransAtlantic excursion. The Best Plate of BBQ in all of England! At least the best plate that TasteeBQ found on that day; in this particular place. [Please, no angry letters from Liverpool insist ing "What about Us!?]. e Palate! ), and created Easy Grilling Recipes for you to try at home. These can be made on any grill: Charcoal, Wood, Gas or Smoker. Check brand instructions for how to use your grill as a smoker. More detailed recipes and printable instructions available on our Recipe Pages. 1. Remove membrane from back of ribs, place in foil and season with sprinkle of Worcestershire Sauce, BBQ Rub, Salt and Pepper. Tightly wrap foil and place in refrigerator overnight (or at least 8 hours). 2. Set up Grill as Smoker, leave Ribs in foil and cook on Medium indirect heat for 1 1/4 - 1 1/2 hours, flip every 30 minutes. Use Hickory or Mesquite Wood Chips to keep smoke going . 3. Once tender and pulling away from bones, remove Ribs from foil and sear on Medium High heat for 5 minutes per side. 4. Glaze with your favorite BBQ Sauce, or serve it on the side. Serving size 2-3 Ribs per person. The restaurant dish features a savory brown sauce, topped by smoked bone marrow and garlic whipped cream . A short-cut is to combine these flavors for similarly scrumptious results. 1. Season 1lb Marrow or Beef Soup Bones same as Ribs, and marinate in foil overnight. 2. Smoke in closed foil packet for 10-30 minutes (depending on size of Bones), open foil for last 5-10 minutes. Fresh (or Dry) Garlic, 1/2 cup Heavy Whipping Cream and dash of BBQ Rub. For Mashed Potatoes- Make your favorite basic Mashed Potato recipe. Add juice from smoked Bone Marrow (and Ribs) to basic Brown Gravy, whisk in Marrow Cream Sauce and heat before serving over Potatoes. 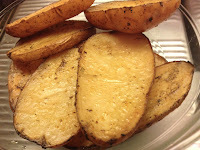 For Smoked Smashed P otatoes- Cut 1 Potato (per person) lengthwise into large 1/2 inch slices. Brush with Olive Oil and season lightly with BBQ Rub. Smoke Potatoes on Medium Low alongside of Ribs, rotating for 1 hour. Once tender, smash Potatoes with fork or masher, until blended. Combine with Marrow Cream Sauce, Butter, Salt and Pepper to taste. May briefly heat on stovetop or microwave to better combine flavors. The original side dish was simply delicious, served along with butter pickles. 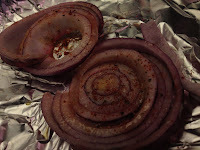 TasteeBQ's version adds red onion for a bit of spice. Optional Grilled Mango adds a sweet twist, as well as nice color. 1. 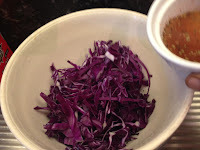 Finely shred 1/2 cup of Red Cabbage (per person), put into bowl. Make dressing with 1tsp Sugar, per 1/4 cup of Red Wine Vinegar. Season with Salt, Pepper and dash of BBQ Rub. 2. 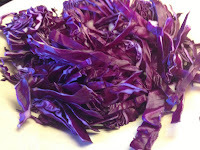 Add 1/3 cup thinly sliced Red Onion per 1 cup of Cabbage. Mix liberally with Dressing, let stand at room temperature for 2 hours, (stirringevery 1/2 hour) before serving. inch slices. Brush with Olive Oil and season lightly with BBQ Rub. Grill on Medium High 3-4 minutes per side. Chop and add Red Onion to Cabbage before Dressing. Chop Mango to top Pickled Red Cabbage before serving. Our superhero TasteeBQ skillfully managed to avoid the villainous BoriNG'Food while abroad. He discovered something to like at each London eatery he infiltrated. Momo's expertly shared how grilling is done in Morocco. Steak & Co and Bodean's proudly offer the best in traditional American BBQ. Pitt Cue Co. stole his heart by elevating modern BBQ to the next level, which is TasteeBQ's ultimate mission. Try these recipes at home. They are guaranteed to make your (part of the) world a better place to eat.